Frederich Cepeda has had quite the week. 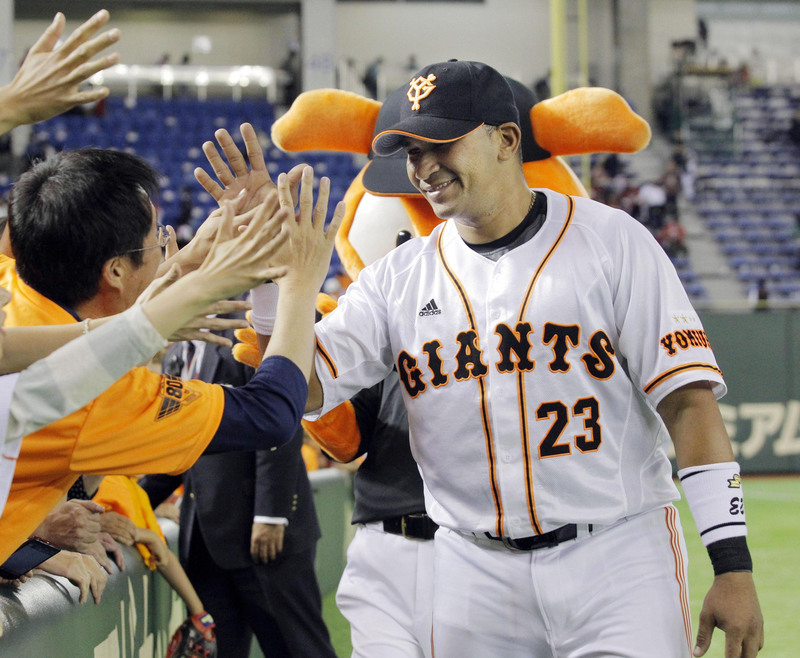 The Cuban star arrived in Japan May 11, had a introductory news conference the next day, and was in a Yomiuri Giants uniform, playing left field and hitting fourth, on May 15, probably before his jetlag had even worn off. He had an RBI single that night, then was 0-for-4 with a pair of strikeouts on Friday. On Saturday, Cepeda homered off Hiroshima Carp ace Kenta Maeda and later took to the podium for his first hero interview as more than 46,000 roared their approval after the game. Hero interviews are just one of the new experiences Cepeda will have as he embarks on his first season in Japan. Joining the Kyojin midseason means he has to adjust to everything on the fly and without the benefit of having had the chance to get acclimated to things in spring camp like many other foreign players. Still, once Cepeda has gotten his feet under him, baseball might be the easy part. He’s only 2-for-15 with a home run and three RBIs so far, but comes with a well-known pedigree after years of starring in Cuba’s domestic league and for the Cuban national team. According to Baseball Reference, Cepeda hit .292/.484/.536 in 85 games for Sancti Spiritus and Artemisa during the 2013-2014 season in Cuba. He also had 26 doubles, 13 homers and 34 RBIs. There’s no questioning Cepeda’s skills, but he’ll be tested as NPB pitchers attempt to pick him apart at the plate. “A lot of the pitchers have great control, are consistent and really mix their pitches well,” Cepeda said when asked his opinion of Japanese hurlers. Cepeda says he’s making adjustments in each at-bat and has gotten a few pointers from Giants infielder Jose Lopez. The eventual return of Leslie Anderson, a fellow Cuban, from a hamstring injury could also aid his transition. Just as important will be getting used to living in Japan and adapting to Japanese culture, something that’s tripped up more than one talented player over the years. Cepeda is also operating under a spotlight as intense as any that’s surrounded a first-year foreign Giants player since 1975, when Davey Johnson arrived to take over third base from Yomiuri legend Shigeo Nagashima. Cepeda’s reputation preceded him, and Yomiuri’s already-large media contingent swelled upon his arrival. Japanese fans are also eager to see how things pan out. Balentien, for one, thinks Cepeda will be just fine and offered a bit of sage advice.